Adorably cute. And what struck me is that yes! She can do this for the rest of her life. She’s building life long skills and developing those each time she does yoga. As they say, yoga is a practice and it’s one that really benefits kids well beyond their time on the mat. We have a great line up of special Spring Break classes this week — plus new events added to the calendar! Full details below. PS. Don’t forget that most classes qualify towards earning you BKY Rewards! PPS. Reminder — no Perinton Rec, Victor Rec or Yoga for Athlete classes this week due to the Easter holiday. We pick up again next week! AGES 4-8. A special Spring Break class at Perinton Rec Center. Separate from our regular Rec Center sessions — anyone can enroll in this class. Perfect for siblings or friends! Instructor: Miss Emma. Come to just kids, just adult or both! AGES 3-8. A special Spring Break class at M/Body. Kids can enjoy a great Butterfly Kids Yoga class while YOU head to an M/Body Barre or Circuit class. BKY instructor: Miss Emma. YOGA FOR TEAMS. A private team session to compliment team training — including stretching, flexibility, balance and targeted strengthening work. AGES 3-5. A great early afternoon class for preschool aged children. A wonderful outlet for exercise balanced with age appropriate poses, focus, balance and coordination work. Plus breathing and calming techniques. AGES 8-13. Tweens! Join us for an evening focused on self care and cultivating kindness for ourselves and others. Standing tall and proud at their Girl Scout yoga session! Adorable Butterfly Kids Yoga butterfly. Love! This team practices together and shows incredible strength — both inside and out. 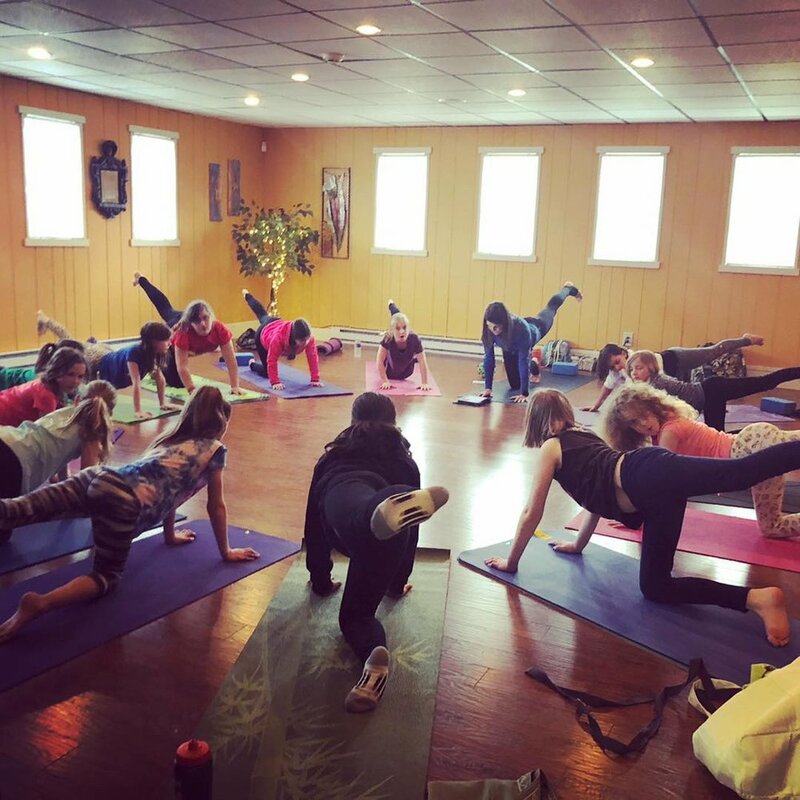 Amazing Tween Yoga+ evening celebrating strength, self care and stress relief. Ahhh.